History, Description of Silver/Gold La Tene Style Ecclesiastical Bowl. metalwork made by Irish craftsmen. Discovered in 1980 on farmland close to the site of an early Irish monastery, in Derrynaflan, County Tipperary, the Derrynaflan Chalice is considered to be one of the most outstanding pieces of goldsmithing in the history of Irish art. 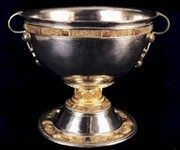 Made by Irish metallurgists in the eighth or ninth century, it illustrates - along with its sister artifacts the Ardagh Chalice and the Moylough Belt Shrine - the superlative metallurgical and artistic skills of Celtic craftsmen during the Insular Art period (c.650-1000) in the ultimate La Tene style. Other Celtic metalwork art in the so-called Derrynaflan Hoard includes a silver paten, a paten stand, a strainer and a bronze basin. All these precious examples of medieval Christian art are on display at the National Museum of Ireland. Similar in construction to the Ardagh Chalice, with a gold filigree band of panels below the rim, emblazoned with amber studs, the Derrynaflan Chalice is made from more valuable metals but with less decoration, although it does display more gold filigree ornamentation. In addition, its three main components (cup, stem and foot) are connected more securely, by means of a hollow stem rather than a copper bolt. 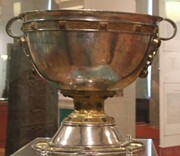 This advance in metallurgical connecting technique (along with the silver filigree decoration of the paten) suggests it was made after the Ardagh Chalice - probably in the ninth century. The Derrynaflan Paten - a type of shallow metal plate for holding the bread during the Eucharist - was assembled by Celtic metalworkers from over 300 separate components. A superb example of medieval jewellery art, it is made from beaten silver, trimmed with silver wire mesh bordered by a ring of gold filigree panels. The fine gold wire is roped then woven into a zoomorphic pattern surrounded with a field of knotwork. The intricate metallurgical designwork on the twenty four panels includes images of kneeling men back to back, sharp fanged animals, one eagle and two serpents all part of a triskele pattern with spirals and interlace. The spirals and knotting are pressed out into gold and silver foil side panels bordered by knitted silver and copper wire. The rim of the paten is decorated with 24 gold and polychrome glass and niello (metallic sulfide) studs. The silver filigree workmanship indicates the influence of Viking craftsmen, while its designwork derives from traditional Celtic art. Treasures like the Derrynaflan Chalice and Paten, the Tara Brooch, the Ardagh Chalice, the Petrie Crown, the Moylough Belt and the Broighter Collar, as well as the famous processional crosses like the 8th/9th century Tully Lough Cross and the great 12th century Cross of Cong, commissioned by Turlough O'Connor, highlight the sophistication of metalworking in medieval Ireland, and along with the great illuminated manuscripts like the Book of Durrow and the Book of Kells, exemplify the contribution of Irish Celtic culture to European art between the fall of Rome and the Italian Renaissance.